Do You Understand Aviation SMS Solutions' Architecture? After a dozen years being an aviation safety management systems (SMS) database architect, I have heard just about every question imaginable about aviation safety software. How many divisions do I need? Before we answer this question, we should familiarize you with the overall architecture of an aviation SMS database solution. Modern aviation SMS database solutions are designed to reduce the grief associated with paper and MS Excel spreadsheets. Instead of being a dumb table, like a sheet within a spreadsheet, an SMS database has business logic associated with the programming code. This allows email and text notifications to be sent at certain points, or other business logic to process and display SMS data to enhance decision-making processes. Many aviation safety managers begin their SMS implementations using spreadsheets and email to pass messages and store SMS data. This data management strategy is not efficient and considerable time is required to comply with all the SMS documentation requirements. Furthermore, annual report generation using spreadsheets requires considerable effort that most safety managers don't eagerly anticipate each year. Some safety managers may adopt point solutions and email, such as a converted "Help Desk" ticket system to serve as their safety reporting system and risk management system. These home-grown solutions end up costing aviation service providers more money in lost time than if they simply found a commercial-off-the-shelf SMS solution. Low-cost, commercial software was designed to address SMS regulatory requirements. These commercial SMS databases are being used by hundreds of aviation service providers. This high volume of users allow the implementation of industry-accepted workflows. Furthermore, costs are lower than if the company had to develop the solution in-house. When an aviation service provider selects a commercial SMS database provider, he will be with that company for at least a decade. You should be assured that the SMS database has all the necessary tools that will facilitate regulatory compliance, as well as adding financial value to your organization. SMS performance monitoring dashboards should be a priority as they allow upper management to easily monitor SMS performance and quickly respond to substandard safety performance. The best aviation SMS database solutions are scalable for small, medium and large aviation service providers. SMS Pro has the ability for administrators to turn off features that are not aligned with the complexity of their operations. Besides having the ability to turn features on and off, and customize your classification schemes, SMS Pro also supports a feature called "divisions." Divisions are a very important topic, especially when your organization is searching for efficiencies. If your aviation SMS database solution is not Web-based, you are missing out on many opportunities. You will never have a best-in-breed aviation SMS. Period! Having Web-enabled SMS database software multiplies the effectiveness of your safety team by approximately three; however, if you focus on all the elements of an ICAO compliant SMS, the factor will increase from five to ten, depending on the complexity of your operations. Inability to efficiently monitor SMS performance. Web-based portals offer secure aviation SMS data accessible to all company stakeholders based on their provided security permissions. The best solutions maximize the utility of templated email notifications and SMS text messaging. From the image above, your safety reporting and auditing systems are feeding the "Data Acquisition" box under SA. 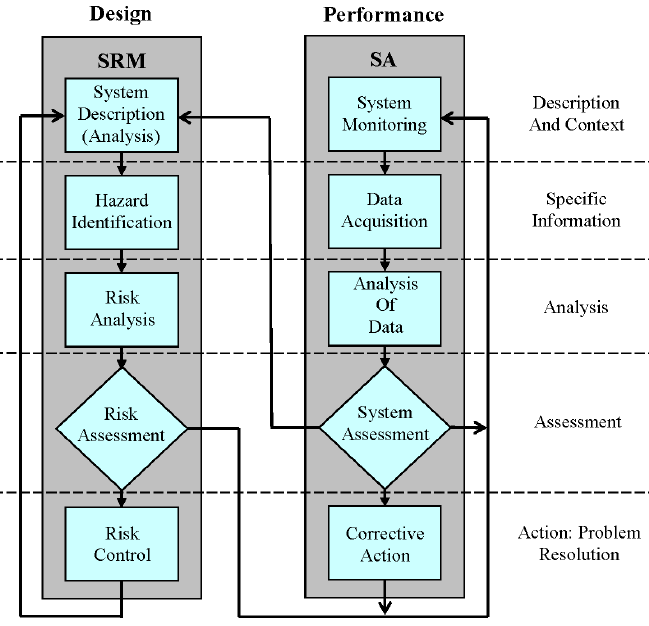 Hazards, risks and risk controls are managed, documented and reviewed in the SRM side. In immature SMS implementations, SRM data is managed in spreadsheets. These spreadsheets are affectionately called a "Hazard Register" or Hazard Risk Register. Spreadsheet hazard registers are available from multiple places on the Web, but often SMS consultants will provide these "Trojan Horses" as they are providing SMS training or SMS implementation consulting. All identified hazards, risks and risk controls are cataloged and risk assessed in these spreadsheets. The reason I call these spreadsheets "Trojan Horses" is because they come into the organization as something that appears very useful initially, but as the Hazard Register grows, it becomes more difficult to manage and monitor. This becomes a big challenge for aviation service providers with 200 to 500 employees in their fourth to eighth year of their SMS implementation. Alternatively, your SRM data may reside in a disconnected point solution without a direct data connection to the SA side. As "System Monitoring" activities send in "issues" into the SMS' risk management workflow, safety managers often have to review hazards, risks and risk controls in their spreadsheet. This is a common problem and does not allow for effective monitoring of risk controls. As one can logically see, the best solution is to have a single SMS database that seamlessly integrates SRM and SA risk management processes. The single SMS database solution allows for easy and efficient setting and monitoring of key safety performance indicators or KPIs. And who doesn't like to have an easy way to track and monitor SMS performance using KPIs? As a further bonus, a full-featured SMS database has the ability to manage the other two pillars' SMS documentation requirements, namely Safety Policy and Safety Promotion. This becomes very important when you consider that SRM and SA processes are dependent on a healthy safety reporting culture. Goals and objectives are tied to your KPIs. In fact, each one of your goals and objectives should be tied to at least one KPIs. You may be used to calling KPIs as safety performance indicators or SPIs. SPIs are subsets of KPIs, but with a focus on safety. For our discussion, KPI is the same as SPI. So what we have now is a database that has SRM and SA workflows that can track KPIs. KPIs can be monitored in the SMS database's goals and objectives tracking features. This is a great labor and time saving capability. Imagine setting annual safety goals and objectives and having to track them all manually. 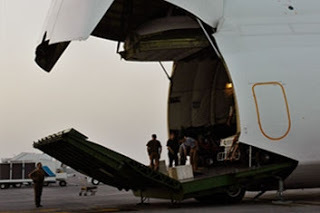 By having a single SMS database that manages SMS documentation from all four pillars, the aviation service provider has a solution that will withstand the most stringent auditor's scrutiny. If you have not yet noticed, SMS auditors like to focus on safety goals and objectives. Safety goals and objectives can be related to the "canary in the coal mine." When there is a problem setting and tracking safety goals and objectives, auditors recognize that this SMS implementation may also have challenges setting and tracking KPIs. As we mentioned previously, safety goals and objectives are tied to KPIs. KPIs are directly linked to both SRM and SA activities. Safety Promotion activities influence SA activities. SMS is a system. SMS data management strategies must also look at SMS as a tightly knit system that requires all SMS data to be easily accessible to be monitored effectively. Otherwise, accountable executives will be unable to fulfill their responsibility to regularly review SMS performance and be able to identify and quickly address any substandard safety performance. A well-designed SMS database software suite ties all SMS documentation elements together under one unified platform. The aviation safety portal is accessible by typing a URL into the address bar. A user belongs to one or more portals and will require a username and password to access the portal. Yes, a user can belong to more than one safety portal. What is the business case for having users participate in multiple safety portals for the same company? Imagine your parent company has four aviation companies. Otherwise, if you belong to an airport authority, imagine that your airport authority manages eight airports. Each airport or aviation company can have their own portal. Best practices will have one operating certificate for each portal. This becomes practical when you consider selling an asset, which is common. You will want a clean break when you sell one of your companies, as the SMS data should go with the sold property. A user, such as a safety manager or director of safety, who works between each of the above business units can have an account in each entity's portal. Instead of having to remember a username and password for each portal, the same credentials can work across all portals. The coherent system that can aggregates real-time reports across all companies. With a safety portal approach, all users enter and modify common safety data within their sphere of control and their assigned permissions. Imagine safety data in one big bucket accessible by all users in the system. Not all employees will enjoy the same access. Permissions are role based and managed by your SMS admin. Rarely do aviation service providers allow all employees to see all SMS data, except in highly transparent safety cultures. Based on over a dozen years of empirical evidence, only two to three percent of companies have this level of transparency. And never will this company have union employees or be part of the FAA's ASAP program. ASAP programs actually hurt transparency in aviation SMS. Now that you have a good idea of portals, there are couple of informal rules we use to determine whether you need to add another portal. Does your company have multiple business entities? Duties and responsibilities of key safety personnel? When associated business entities don't share the above, it is recommended that each business entity has their own portal. A single SMS database should not be used by two companies as a general rule. The concern from the regulator will be whether there is direct control over SMS data management activities by each accountable executive. There are a few companies that provide SMS data management services for small aviation service providers. This is beyond the scope of our discussion. With a default SMS portal, there is no grouping of users into departments or sections. All users see the same data as long as they maintain the proper permissions. In many cases, this solution works fine for smaller companies with fewer than 80-100 employees. Smaller companies typically have informal, flatter organizational structures where department heads from one department commonly share authority in other departments. Do you have operations in multiple regions? Do managers at one location (or department) direct employees at another location (or department)? Do you want managers in Flight Ops to see reported issues from Engineering? How many reported issues do you receive from each department? Do you want xyz department's data isolated from other departments, such as security data? When aviation service providers wish to keep data separate from other users with similar roles and permissions, then divisions are used. It is important to note that you understand that we refer to "Users with the same permissions." For example, let's consider an airport authority. You may have a separate safety manager for each airport. 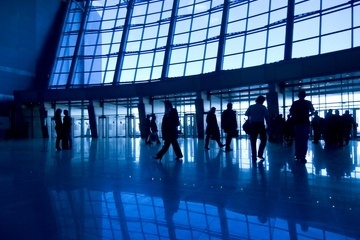 You may not want all safety managers to see reported issues at all airports. Likewise, you may not want maintenance personnel seeing SMS data related to flight ops, and vice versa. Again, this is where your comfort level is with transparency of SMS data. Divisions allow the separation of data and users into logical groups. Re-assess all reported safety issues using the new division's risk matrix. An SMS database has considerable flexibility. Well, I should rephrase this: some SMS databases have considerable flexibility. You have to be careful when selecting SMS software, as this choice can be expensive to change in the future. There are some companies that aggregate software solutions to create a different type of hybrid SMS solution. For example, ETQ does a good job of pulling together point solutions and putting them together under a separate brand. Based on this approach, it is highly unlikely that ETQ has a single integrated database, but multiple databases cobbled together for their SMS database offering. Slower support times are understandable with a hybrid point solution. 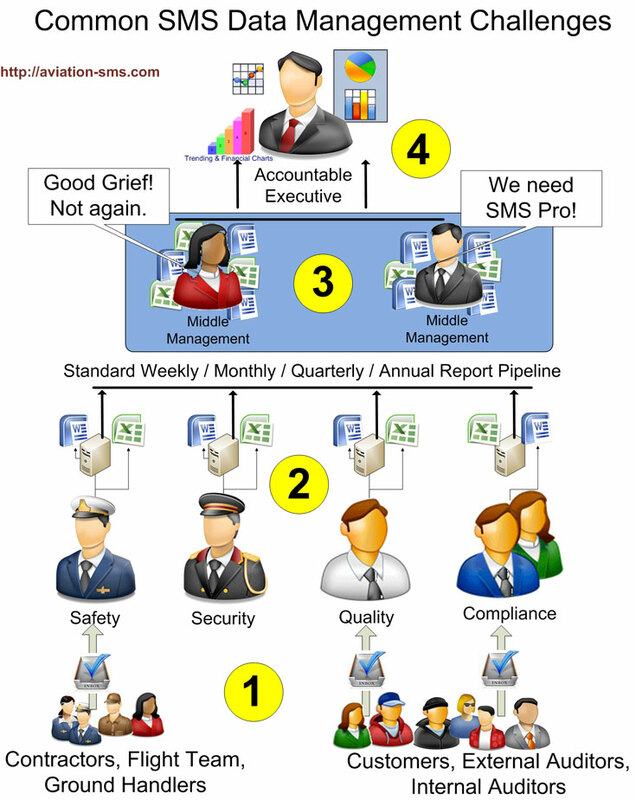 When the safety manager has a support problem or query, he contacts the SMS database provider. The SMS database provider then contacts the original developers who may be providing the technical support. Once the original developers fix the problem, the developers contact the SMS database provider who then relays the support response finally to the safety manager. Now that you have a good idea of portals and divisions, there are couple rules of thumbs we use to determine whether you need to add divisions. Does your company have more than 80-100 employees? Although we have worked with many operators, we understand each company is unique. Working together, we can find an excellent solution for your safety program. Remember: we are here to help. 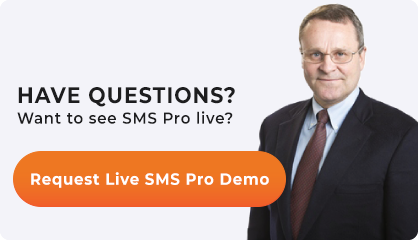 If you have not yet watched the SMS Pro demo videos, here they are for your review.